I work from your photographs, so please send me some good quality photos by email or post. Please let me know which one best captures your pets personality. 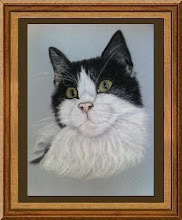 Ensure your pet's eyes are clearly visible as the eyes are very important to the portrait. 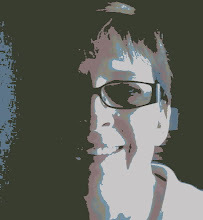 For a head/shoulder portrait the face should fill most of the picture unless you have decided on a full body portrait of course. Ideally the photo should be taken at the pet’s eye level rather than looking down.This makes for a much better photograph. The balance is payable on completion/approval of your portrait, and only if completely satisfied. You can email me with your individual requirements and I will respond to your email within 24 hours OR check out my portrait sizes that are available to purchase here on my Blog or in my Webstore. Email Address: thehouseofgenista@hotmail.com should you wish to email. 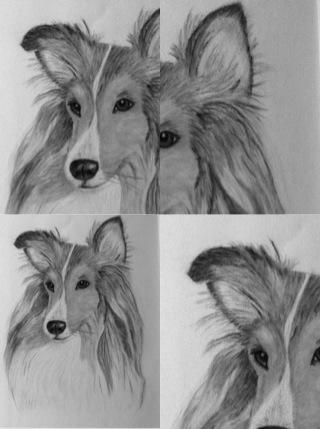 These make ideal bedside portraits or on a sideboard or shelf. 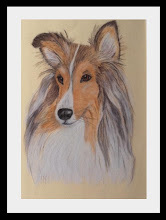 They are only suitable for a single head portrait and come complete with white cardboard mount and black frame (as shown above) in the price. Postage/Packing is NOT included in the price. 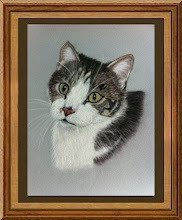 My Miniature Pastel Pet Portraits make IDEAL Christmas Gifts for any pet lover to treasure forever. 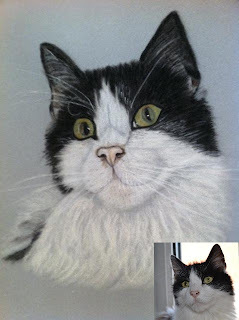 Colours of both portraits look a slightly different shade in the photos as were taken by my i phone so not very good quality I'm afraid. 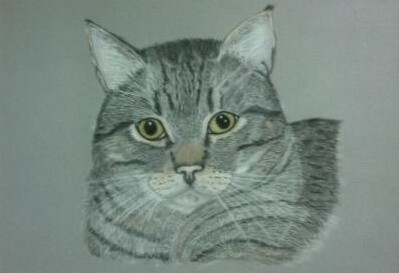 Look much better in real life so to speak. 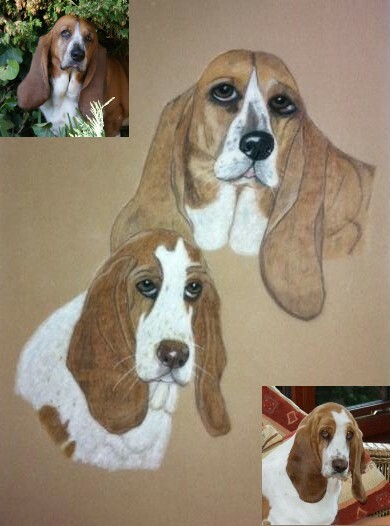 Martha and Baileys' pastel portrait was created on a lovely sandy colour pastel velour paper using pastels/pastel pencils. Size 11" x 14" when matted and framed. 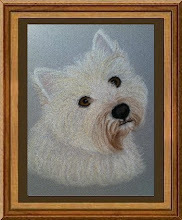 It has been framed in a textured photo frame in gold effect with a cream mount. 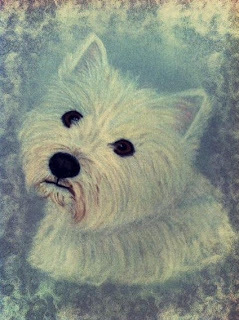 Brians' pastel portrait was created on a lovely light grey pastel velour paper (not blue as looks in photos) using pastels/pastel pencils. 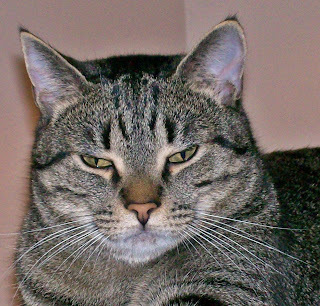 Brains' eyes have been drawn open wider than in the photo. 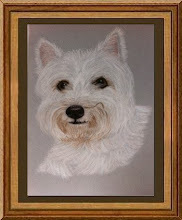 Size 11" x 14" when matted and framed, It has been framed in a textured photo frame in a silver effct with a white mount. Both portraits are now on their way to their new homes. 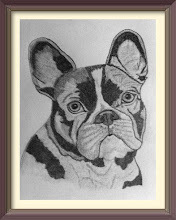 A BIG "Thank You" to everyone who entered my Pastel Pet Portrait Give-A-Way. All the names of entrants were put into a tub, the correct amount of times this morning and the winner was pulled out by "Connor" a 14 year old animal lover. 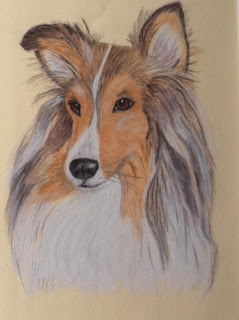 I will be emailing both winners to request clear head study photographs of their beloved pets in order for me to create their pastel portrait and will be requesting permission to add their photographs here on this post. Thank you again to all who entered. 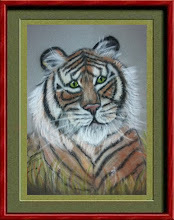 Please look out for tomorrows post which will contain a Special Offer to everyone who entered my Give-A-Way. 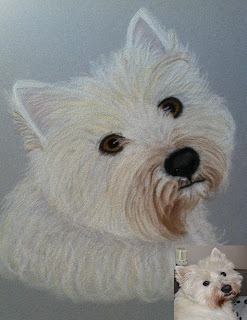 I have recently started doing commissions for Pastel Pet Portraits as you have probably seen on previous posts. To celebrate my new venture I am having a blog Give-A-Way of a Pastel Pet Portrait. All you need to do to enter my Give-A-Way is become a follower of this blog and/or my Teddy Bear blog HERE at "The House Of Genista" plus leave a comment on either one of my Give-A-Way posts telling me the name of your dog/cat, breed, colour etc and your email address so that I can contact the winner. Comments will not be published, they will be kept private and deleted after the draw has taken place. 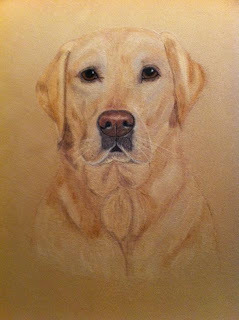 The winner will need to send me by email a very clear photograph of their pet to enable me to create the pastel portrait. The better quality the photo the better the portrait will be. 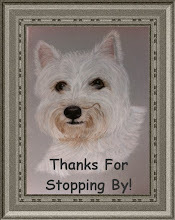 If you are already a follower of this blog and/or my Teddy Bear blog I will put your name in twice. If you become a follower of both I will put your name in two more times. 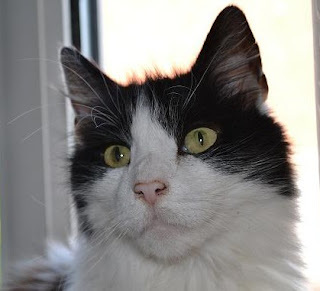 If you put my Give-A-Way on your blog I will put your name in the draw for another chance also, but please let me know you have done so. Comments that do not contain an email address I have published. I hope you will all enter and I look forward to creating a Pastel Pet Portrait for the winner. 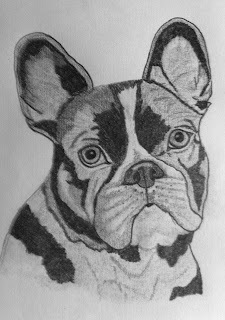 A cute French Bulldog in graphite pencil. The light is not very good here and does not do the drawing justice. I will post better photographs as soon as possible.